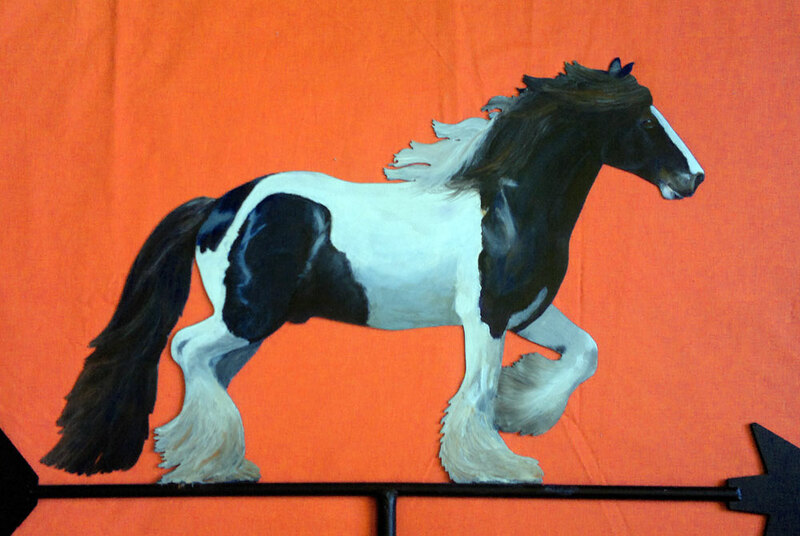 Hand painted portrait of our Gypsy Cob stallion Tom of Brackenhill. This hand painted weathervane is a memorial for our own much loved horse. The vane was made after his journey over the Rainbow Bridge. Our stallion Tom was one of the first of his breed in Australia and for many people their introduction to Gypsy horses and the inspiration to own their own Cob. We feel incredibly proud of him. After posting progress photos on Facebook we realised from the responses we had, that there are many other people who wish to celebrate their fur babies with a hand painted portrait. We now offer this service although the time required to produce works like this limit the number we can create. This is a portrait of Billie a much loved old girl that was commissioned by the sister of the dog's owner. It was a surprise Christmas gift. 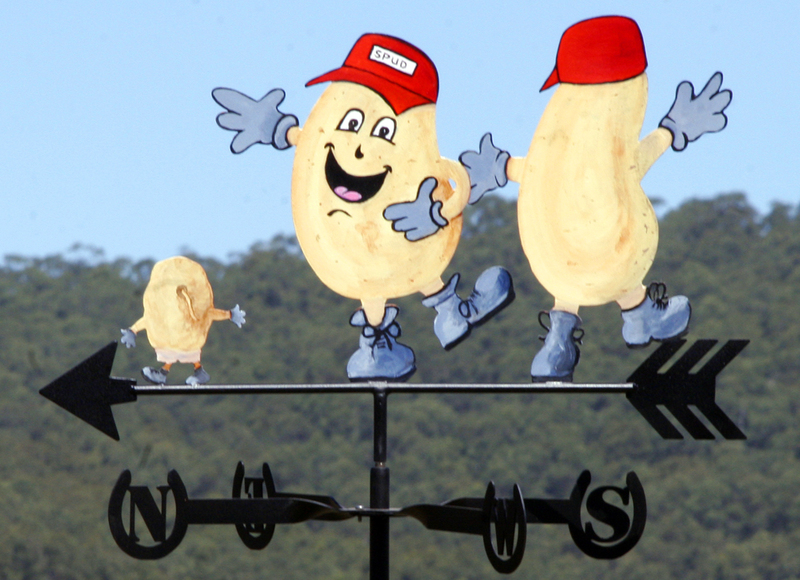 The idea for it came about after a casual comment made on a road trip when the man spotted a weathervane and commented to his sister how one day he would love to get one. Imagine his surprise on Christmas day when he opened his gift to not only find a weathervane ~ it was also one of his own lovely Billie! 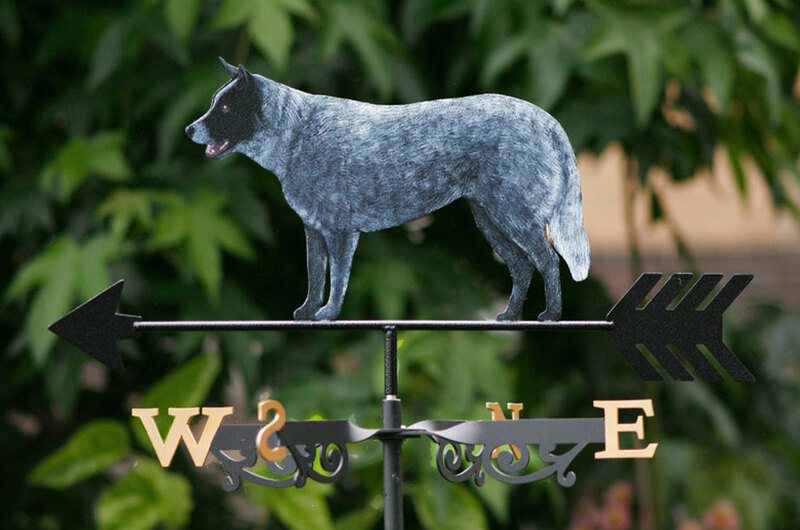 Bespoke metal art weathervane hand painted. This weathervane design was based on a photo of a logo that was emailed to use to see what we could do with it. The original artwork did not have "baby" spud, he was added to ensure that the balance was correct. It's critical that weathervanes are almost perfectly balanced weight wise over the pivot point but have a much larger surface area on the tail side of the weathervane to ensure that they respond well to the wind. All of our weather vanes are tested prior to leaving to ensure that they work well even in light breezes.